Stafford will visit Waverly in a match-up of two schools with very different playoff histories. Waverly is in the playoffs for the tenth time in the past eleven seasons; a run that includes back-to-back state titles in 2005 and 2006. Stafford, on the other hand, is making just its fourth playoff appearance in school history and first since 1990. In fact, Stafford has never scored a point in the state playoffs, having been shut out by a combined 143-0 in its appearnces. This year’s Trojans have plenty of firepower to get into the scoring column. Stafford has averaged more than 51 points per game with their only losses coming to playoff qualifiers in Central Plains (8-1) and South Barber (7-2). The Trojans are led by rushing duo of senior Tristin Paulsen and junior Ethan Johnson. Paulsen has rushed for 1,218 yards and 21 touchdowns, while Johnson has rushed for 1,227 yards and 20 scores. Quarterback Derek McClure has also thrown for more than 700 yards and eight scores. Waverly boasts one of Division II’s best players in senior Austin Bailey. He has posted some big rushing games this season including more than 200 yards against playoff qualifiers Yates Center and Chetopa. The Bulldogs opened the state’s eyes with an 18-0 shutout of Class 3A member Fredonia back in Week 6 and has posted two other shutouts. The Bulldogs have lost in the first round of the playoffs in each of the past five season, and Paulsen and Johnson could very well make that six in a row in giving Stafford its first ever playoff victory. If you like offense, this is the game for you. The two top scoring offenses in Division II will meet in Kiowa on Tuesday as Chetopa travels to South Barber. 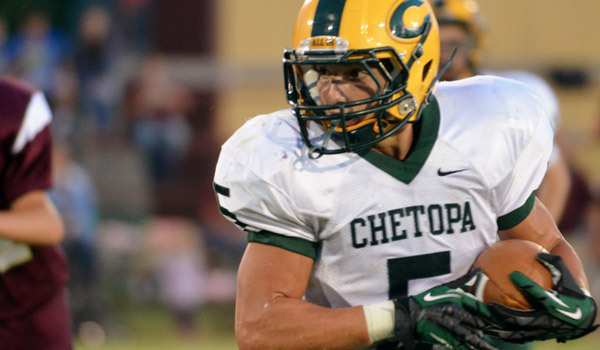 Chetopa is the top scoring offense in Division II with 524 points or more than 58 points per game. The Green Hornets scored 56 and 42 points in their respective losses to Madison and Waverly. Junior quarterback Philip Moses has passed for more than 1,900 yards and 30 touchdowns against only nine interceptions. Junior running back Derrick Cassell (6-1, 195) is one of the best in eight-man football. He has rushed for more than 1,100 yards and 27 touchdowns on the season and leads the Hornets with more than 100 tackles. Austen Sanders has hauled in more than 60 receptions for over 1,100 yards and 23 touchdowns. Freshman Alex Carter is second on the team with more than 90 tackles. South Barber features a prolific offense of its own behind junior quarterback Peyton Yandel and running back Dylan Allison. The Chieftains have scored 488 points for an average of 54 per game. Yandel is the leader and a definite dual threat. He has passed for 1,026 yards and 15 touchdowns and rushed for 1,237 yards and 28 scores. Allison has rushed for 1,194 yards and 16 touchdowns while averaging more than ten yards per carry. He is also the team’s leading receiver with 29 catches for 487 yards and nine touchdowns. On defense, Allison leads the way with 131 total stops or 14.6 tackles per game. This game will likely feature a lot of points, but which defense can come up with a key stop may be the difference. These two teams have matched up the last three years in the playoffs, though each contest has been in Kensington – and Thunder Ridge has won all three. Neither of the two teams played in Week 9. Thunder Ridge had a scheduled bye and Wallace County had a forfeit contest versus Wheatland-Grinnell. Last year’s contest was in the sub-state championship game, while the first two times came in the first round. Both coaches have great success – Jerry Voorhees has back-to-back state trips with Thunder Ridge with a state title two years ago, while Kevin Ayers is 3-0 all-time at state. The winner here is in strong position for another state run. Wallace County has beaten teams by a collective margin of 371-34 and easily leads eight-man in scoring defense. The Wildcats have six blowout victories, including a shutout of playoff-bound Dighton, and two very quality wins against Hoxie and Hanover. The Wildcats have just one turnover all season are plus-19 in turnover margin, and have seven defensive/special teams TDs. Thunder Ridge, paced by a 1,000-yard season from Trent Rietzke, moved senior Garrett Krueger from quarterback to fullback and put Dylan Bretton at quarterback in midseason. The move has helped the Longhorns outscore teams 417-120. Wallace County’s strength one through eight, playing at home and defense is enough to overcome Rietzke’s running and Thunder Ridge’s physicality. This marks Dighton’s first playoff berth since 1997. Dighton has won just two playoff games in school annals, both in 1995 when it reached the semifinals. Fowler has won just nine playoff games in school annals. Last year’s 17-14 first-round victory against Victoria was the first playoff win since 1984. Dighton has a plus-two improvement from last season after it missed the postseason with 7-2 and 6-3 seasons in 2011 and ’10. Before then, Dighton had an 11-man co-operative agreement with Ness City. Dighton, with 12 players, has averaged 111 passing yards and 173 receiving yards. It qualified on tiebreaker points over Otis-Bison and Sylvan-Lucas. Freshman Tyler Lingg has completed 48 of 96 for 745 yards with an 8/5 TD/INT ratio. Senior Isaac Alinor has rushed 129 times for 866 yards and 11 scores, caught 26 passes for 405 yards and four TDs. Overall, he has 1,647 all-purpose yards and 16 TDs. Fowler is 2-2 at home but 5-0 on the road. The Goldbugs have outscored opponents 418-232 under second-year coach Matt Bell. Both of the Goldbugs’ losses came to playoff teams Hodgeman County and Spearville. Senior quarterback Taylin Bird has completed 81 of 125 passes for 1,248 yards and a 27/4 TD/INT ratio. Senior Ty Clark has 56 catches for 909 yards and 20 scores. Defensively, Clark has delivered another huge season with five interceptions for 110 yards, four forced fumbles and two fumble recoveries. Dighton has put together a nice season and Alinor is an all-state player, but Fowler, with Bird and Clark, is too much.